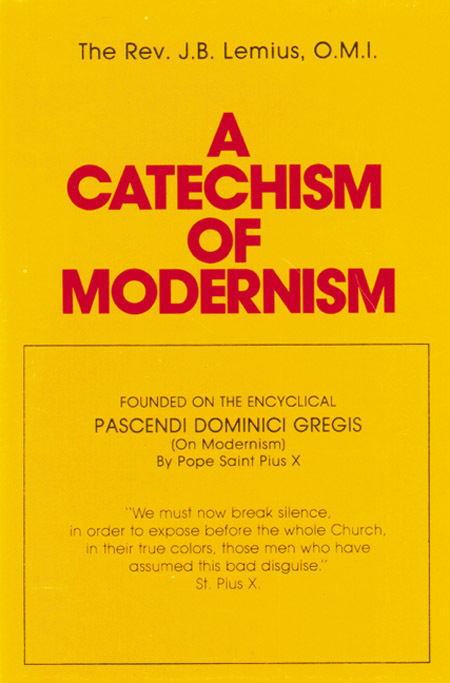 This post is part three in a series of posts on the Synod of the Family and Modernism. Read part two here. Q. In their war against scholastic philosophy, how do the Modernists deal with the second obstacle, as they call Tradition? A. They exercise all their ingenuity in diminishing the force and falsifying the character of Tradition, so as to rob it of all its weight. We see in regards to the Synod of the Family how the Modernist and heretical bishops are trying to frame the perspective of traditional marriage, as unloving, unkind, or even bigoted towards those who have divorced, remarried or actively engage in homosexual activity. They frame the narrative in such a way that Tradition becomes a negative ideal. Tradition becomes an ideal worse than any other sin, and those who cling to it are enemies. Words are said such as “God is a God of surprises”, to imply that even God doesn’t cling to Tradition. The Church which Jesus Christ instituted and gave the authority to establish Tradition is no longer in charge of determining what is and isn’t Tradition and that the Holy Spirit is moving hearts and minds. Of course, this is nonsensical as Jesus Christ, Who is the same yesterday as He is today and as He is tomorrow, would not change His mind. The Holy Spirit, Who is One with God the Father and Jesus Christ the Son, would not change His mind. Tradition is an element of Catholicism that is of supreme importance because Tradition helps us to see that the Holy Catholic Church is indeed the One Church in which Jesus Christ established. With the Church’s unchanging stance on many issues over the course of 2,000 years, it shows that God is indeed with this Church, as the average Protestant church changes its mind depending on who its pastor is. Tradition is important to our Catholic faith, as we will see declared in both the Council of Nicea and the Council of Constantinople below. Q. 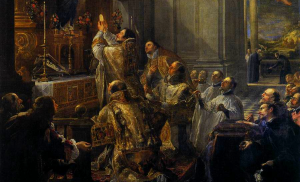 In speaking of Tradition, what law of the second Council of Nicea should true Catholics have in mind? A. 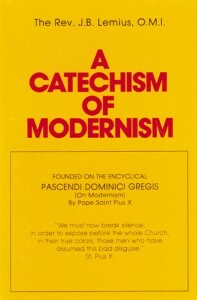 But for Catholics the second Council of Nicea will always have the force of law, where it condemns those who dare, after the impious fashions of heretics, to deride the ecclesiastical traditions, to invent novelties of some kind … or endeavor by malice or craft to overthrow any one of the legitimate traditions of the Catholic Church. Q. Give the law of the fourth Council of Constantinople on Tradition? A. Catholics will hold for law, also, the profession of the fourth Council of Constantinople: We, therefore, profess to conserve and guard the rules bequeathed to the Holy Catholic and Apostolic Church by the Holy and most illustrious Apostles, by the orthodox Councils, both general and local, and by every one of those divine interpreters, the Fathers and Doctors of the Church. Only the teachings of the Holy Catholic Church and Our Blessed Lord, Jesus Christ, are worthy to be followed. Anything that deviates from these teachings is not of God, but of His adversary, the Devil.